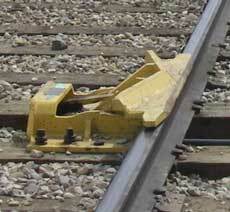 This lockable metal device is used to protect spur or mainline track from a runaway railway vehicle. This is a lockable metal device meant to protect a spur (loading rack) or mainline track from a runaway railway vehicle. It is permanently attached to a hard wood tie that will allow the derail to be opened or closed over one rail. Does my service provider have derails? Yes, your service provider is required to install derails to protect their mainline track. When must a derail be utilized by a facility handling dangerous goods? Rolling stock shall be protected during the loading or unloading of dangerous goods by a derail or a switch that is locked with a lock that is controlled by the facility. The derail must be located at a minimum distance of one car length from the tank car on the connected end(s) of the track. How is a derail used? The facility that is loading or unloading dangerous goods from a railway vehicle must develop procedures for the use of the derail. Where else could a derail be utilized in a non-dangerous goods facility? The use of a derail is encouraged for the protection of personnel working around any rail equipment during the loading and unloading of non-dangerous goods or any time personnel are working on or around a railway vehicle. Where is a derail installed? Generally a derail is installed on a facilities track at a minimum distance of one car length from the tank car on the connected end(s) of the track. Your rail service provider should be consulted to determine the best location. Who is responsible for locking and unlocking a company owned derail? Will railway personnel disengage the derail? Only after the facility has removed their lock will railway personnel will disengage the derail to allow for movement over the track. Who must I inform if I am going to install a derail? If you install a derail you must notify your service provider at least two weeks before the derail is installed. Contact the Risk Management Officer at CN 780-472-3941 or the Area Service Manager at CPR 403-303-8727. What else has to be done if a derail is to be used? A yellow sign with the words (in vertical) "DERAIL" must be erected beside the derail. Personnel must be trained in the use of a derail and a company policy must be developed and implemented on the use of a derail. Where can I obtain a derail?